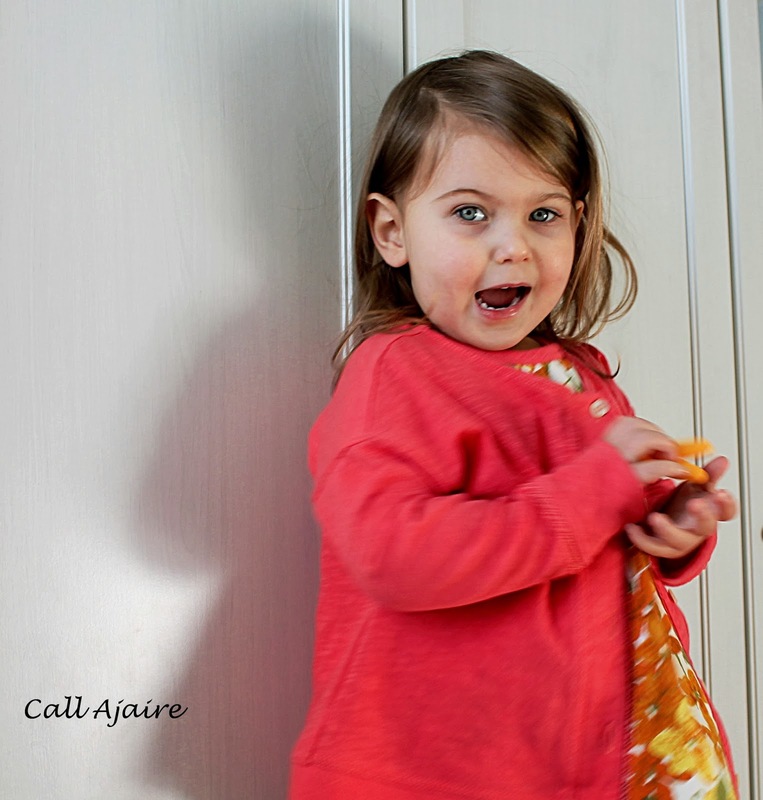 We’re on to week three of Project Run & Play and the theme is Refashion. It’s also the first day of Winter KCW so there is a lot of sewing in my immediate future. But we’ll start with my refashion look. 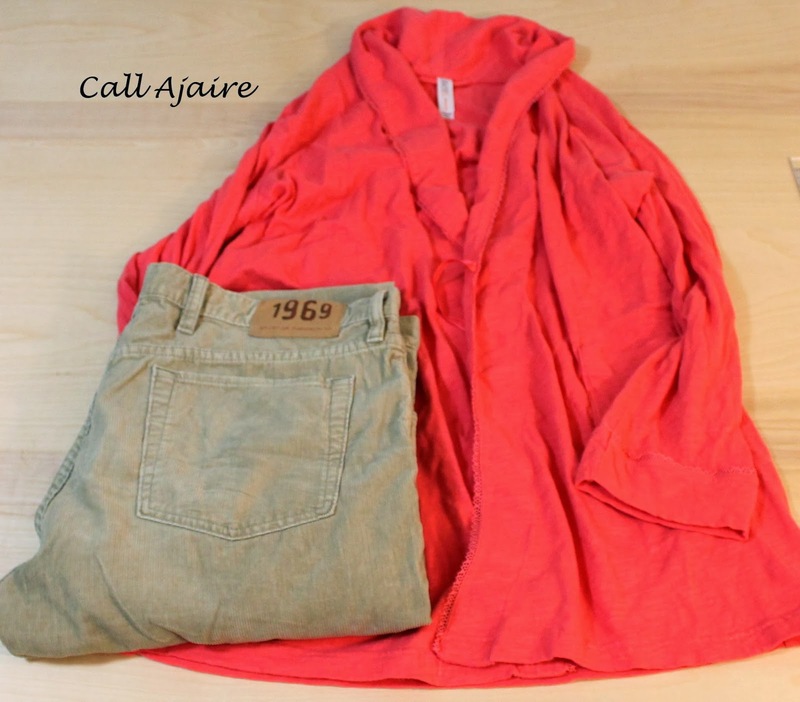 For refashioning I chose an old pair of khaki corduroys that my husband doesn’t wear anymore and a light-weight coral knit robe that I also no longer wear. I knew immediately that I wanted to make a pair of shorts from the corduroys and a cardigan from the robe. I had no idea what top I’d make for under the cardigan, but I knew inspiration would hit eventually. 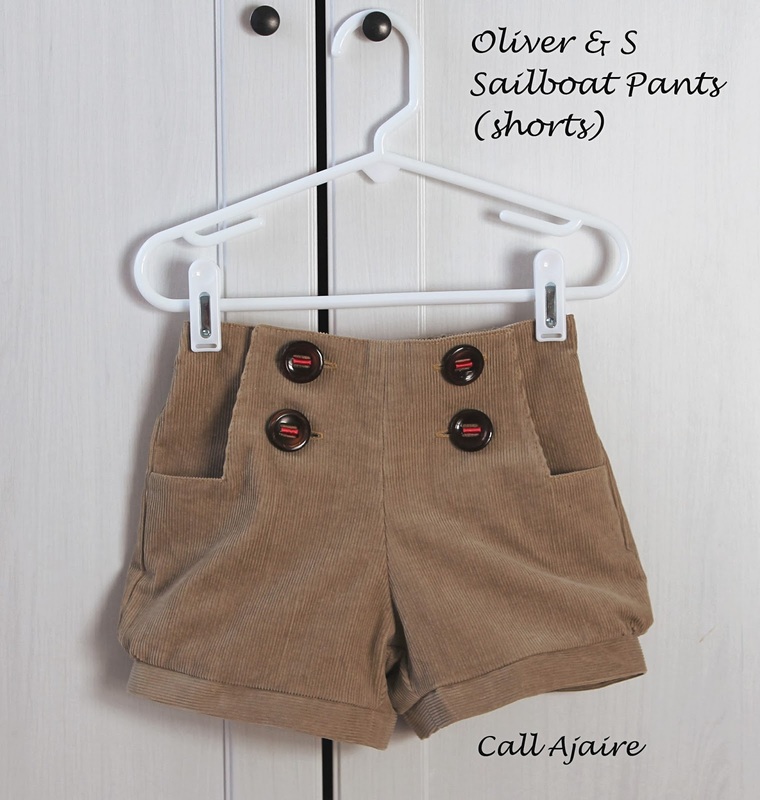 The shorts were made using the Oliver & S Sailboat Pants in size 3T shortened to about two inches below the crotch seam. I gathered the outside edge of each leg and attached a band for a cute bubble look. 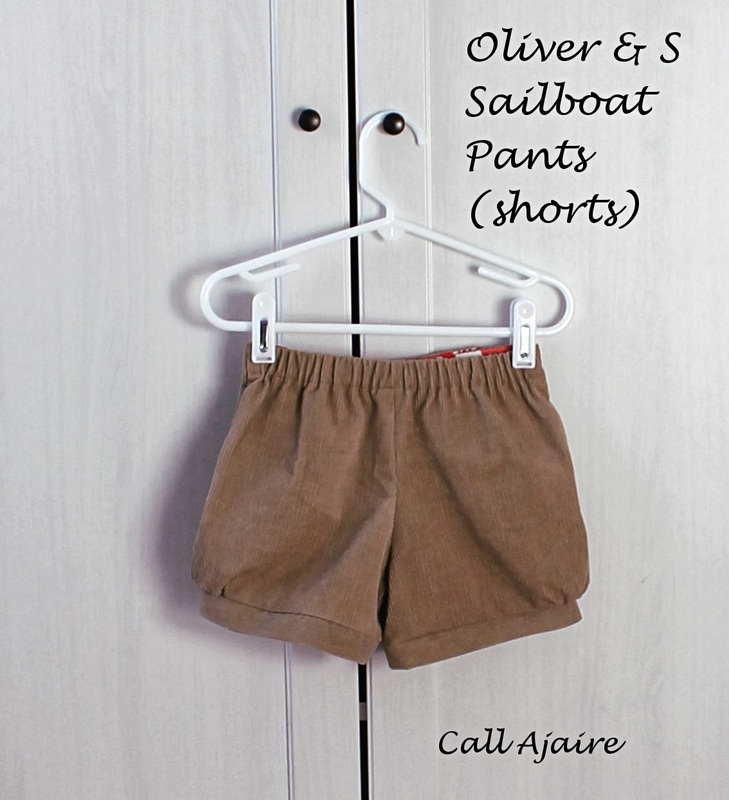 Otherwise I followed the pants’ pattern instructions for the rest of the shorts. 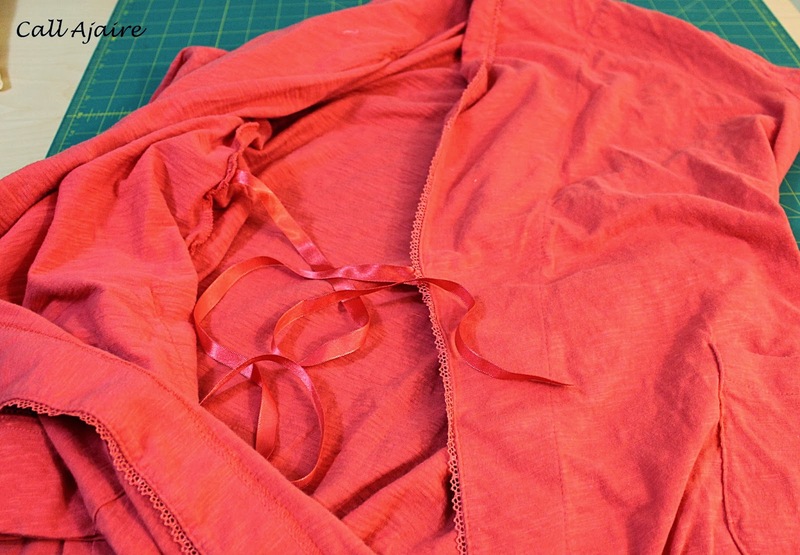 For the facings I used a coral print to connect the cardigan I was making with the shorts. Plus the print is adorable so I thought it’d be fun to have the fabric surprise on the inside of the opening. I also used these cool buttons I took off an old sweater. They are attached with ribbon instead of thread which I think is unusual and interesting. I used these type of buttons (from another sweater) way back when Bean was less than a year old and fell in love with them. Now that I’ve used all eight of the buttons I will need to figure out how to make some of them myself. I can’t get enough of them, hehe. The ribbon was from the ties of the old robe so they were refashioned too. The fit is a tad big, but that was in the hope that these will fit for wear this summer as well. For now they work great over a pair of tights. 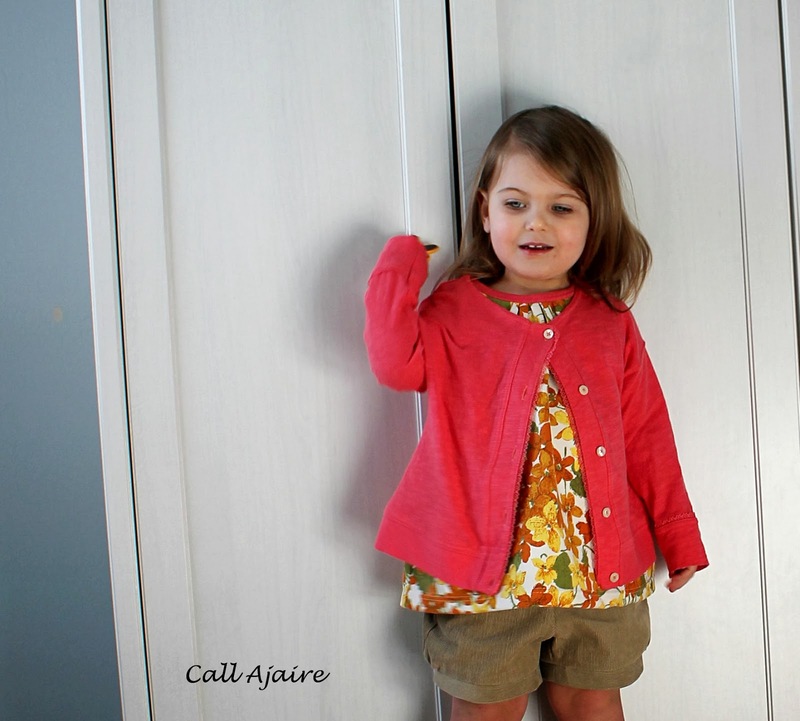 I sewed the cardi using the pattern instructions for adding the sleeves. I topstitched on the sleeve seam since I wanted that dropped shoulder seam to have an extra detail. The robe sleeve arm bands were used instead of finishing the sleeves a new way. The edges were so pretty that I wanted to leave them that way. Once the sleeves and the side seams were sewn, I attached a band to the bottom of the cardi. This came from the back top edge of the robe. Then I attached a band to each edge of the front of the cardi. These bands came from the front edges of the robe. 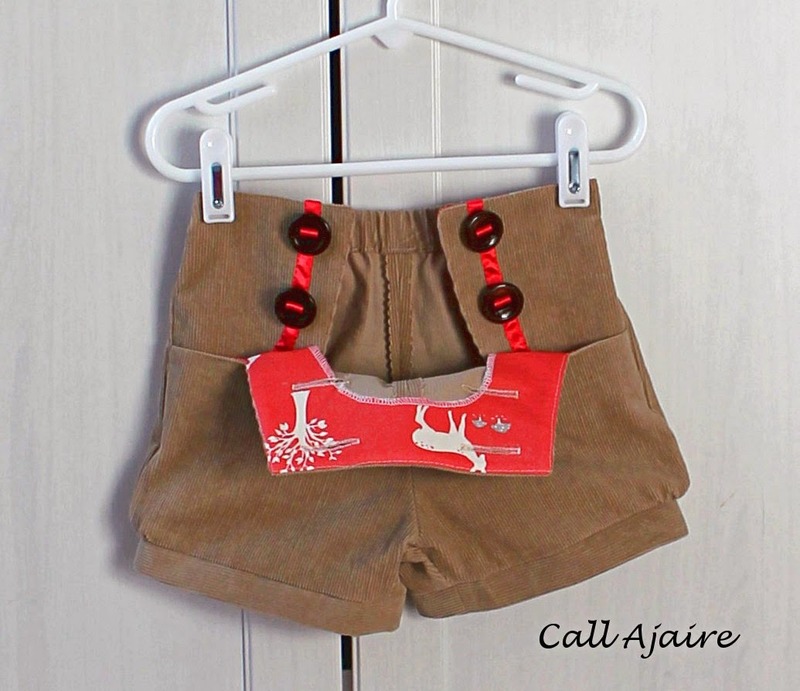 They too had pretty little details that I decided to keep in the refashion. I made button holes on one band and sewed some buttons (from another one of my husband’s cast offs) to the other. 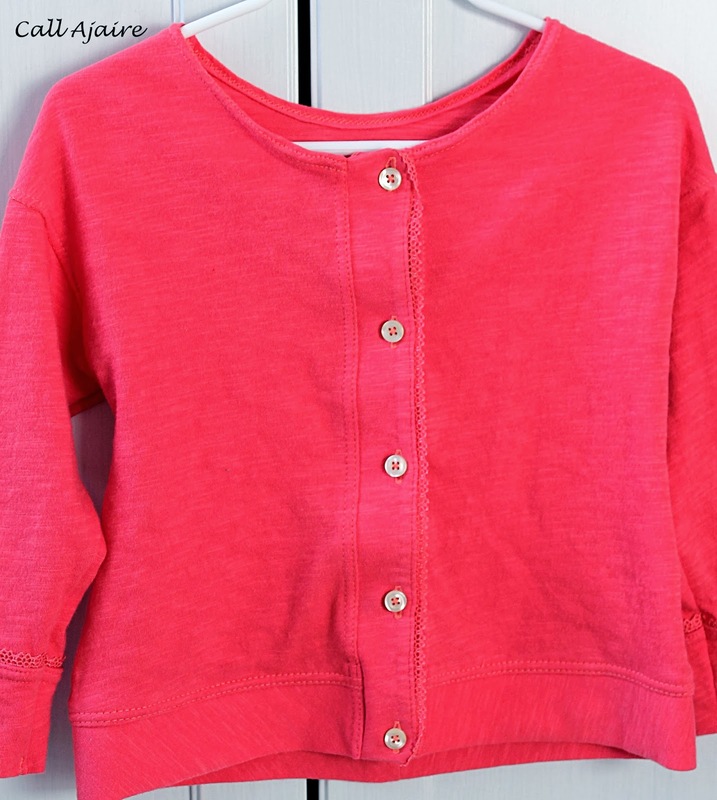 The cardi is super light-weight so it’ll be a great spring/summer layer as well. I love the fit on Bean and it’s a great color. 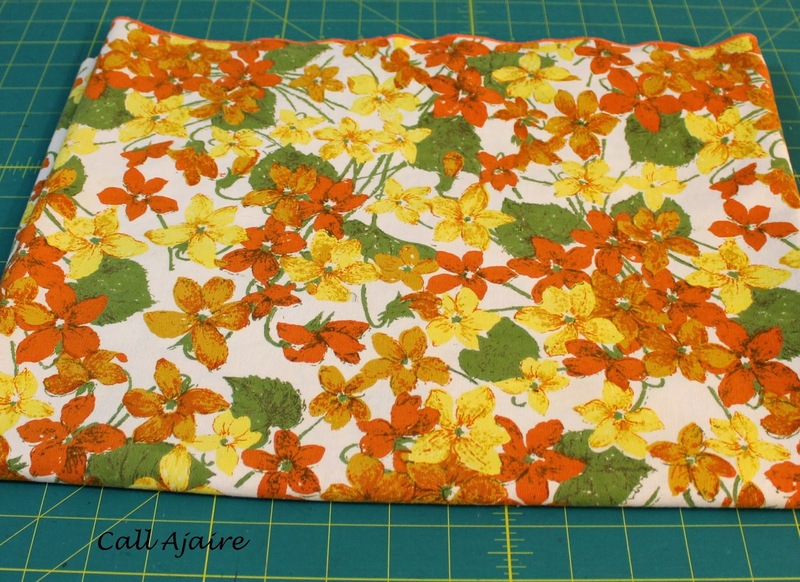 As I mentioned before, I wasn’t sure what I would make for a top, but I did know I wanted a floral pattern. I have so many fabrics in my stash that would have worked perfectly, but I really wanted to keep this to a refashion only look. As I was looking for something in one of our closets this weekend I stumbled upon this amazing vintage tablecloth that Shannon from Little Kids Grow sent me ages ago. I had completely forgotten about it and when I saw it I knew that should be used for the top. 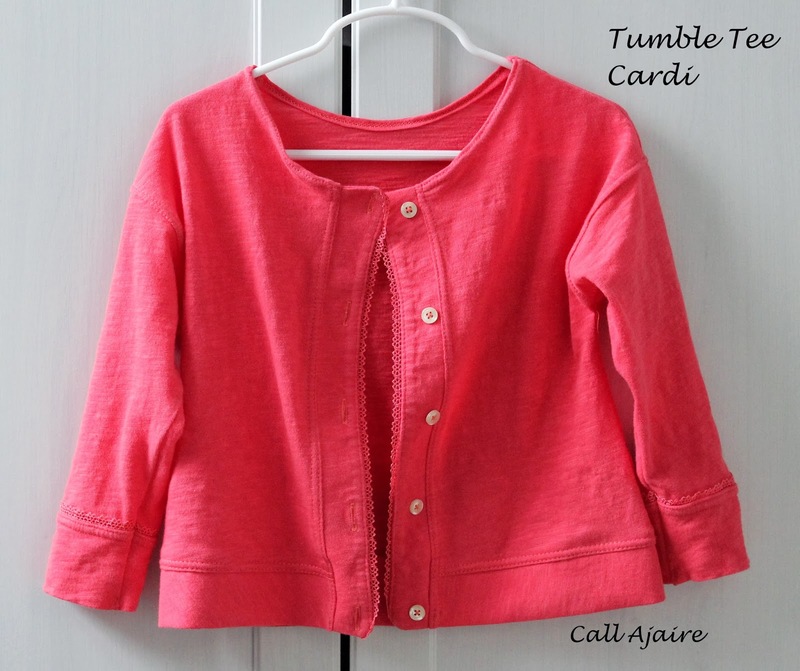 The colors are a great compliment to the coral cardi and the fabric contrasts between the ribs of the corduroy, light-weight drape of the cardi knit, and soft smooth feel of the worn in woven tablecloth were exactly what I was looking for. 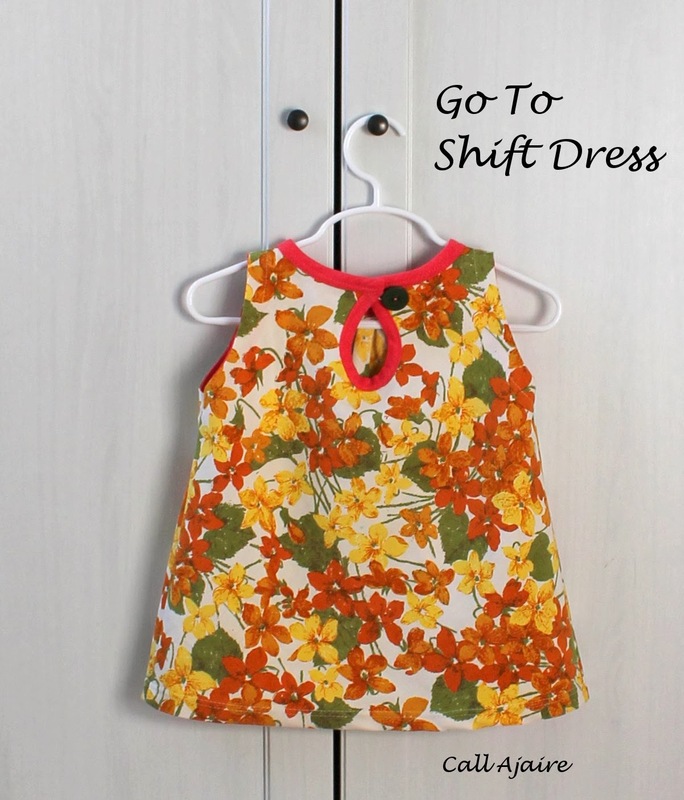 The pattern is the Go To Shift Dress (*affiliate link) from Go To Patterns . 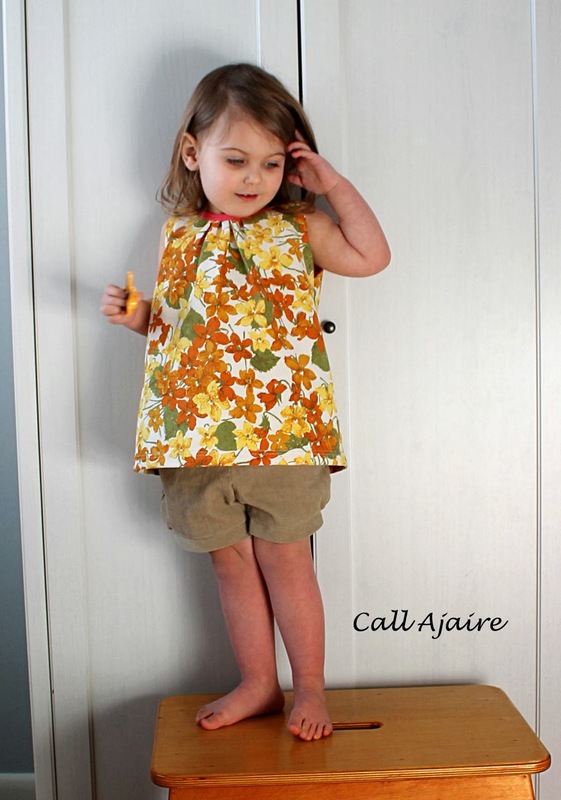 I made the size 3T, but shortened it a ton to make it a tunic instead of a dress. I made one in knit last year and it was a great top by the end of the summer so I’m hoping for something similar this year. I used the knit from the robe to make the bias bindings and tie in the coral. The green button is from my stash and came from a sweater I had years ago. The contrast of the green and coral is so pretty to me. Altogether I am so pleased with this look. It’s three pieces that fit well together, but can work perfectly paired with other staples in Bean’s wardrobe. That’s a refashion win for sure. And a great way to kick off KCW. I know it’s supposed to be winter sewing, but does anyone else start to look ahead to spring as soon as new year’s is over? I don’t know why I always feel that way when our worst winter weather is usually in February or March. Winter won’t be over for quite some time, so I’m happy these three pieces can work for layering. 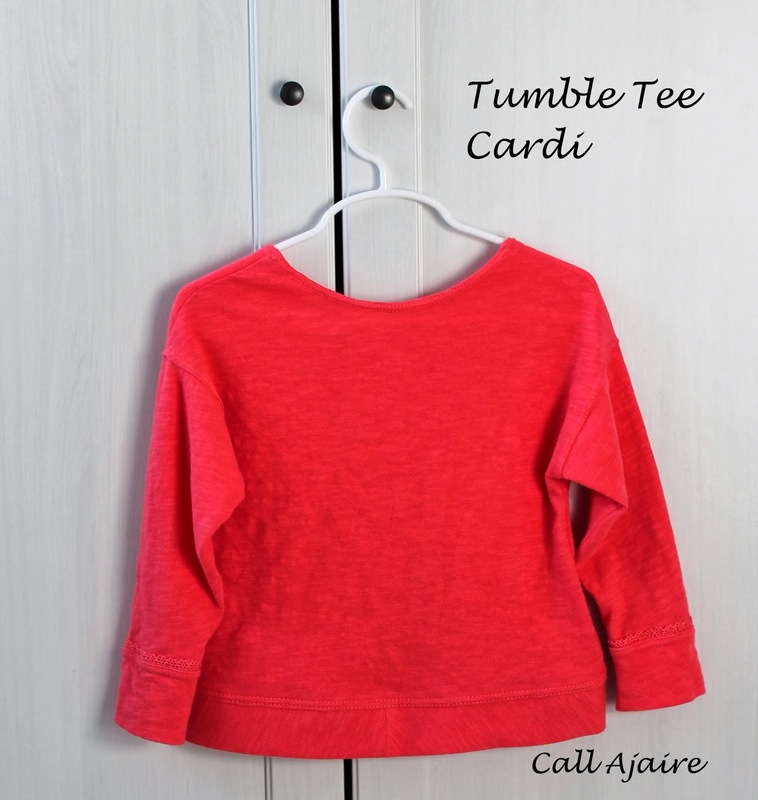 As for the rest of my KCW list, I think I’ll be making a couple of long sleeve tumble tees, a dress or two, and maybe another pair of Hosh pants? Is that too ambitious? Maybe, but it’ll be fun to try. What’s on your list? Don’t forget to look through the Project Run & Play sew along linky this week and of course to vote for one of the designers’ looks. I love Refashion week and as with every week I can’t wait to see what everyone comes up with. This was right before she decided she should throw the bunny she had in her hand. Look at those wild eyes. And this was AS she was throwing it. At least she still feels compelled to yell “FRO” right before she’s about to throw something so I am prepared for the projectile. Sound about right for a two year old? Love this outfit! All the pieces are so versatile and work well together. Very cute! I can't wait to find a chance to use that ribbon trick with buttons some day – smart. I love layers. Nice work! I love separates that can work together or apart! These are unexpected fabrics that work well together with the accents you've used to tie them together. I'm with you about never ending winters! Very adorable outfit! I love how well they pair up and also will all be great seperates! What a neat feature- the buttons on the shorts. I really love that!! My favorite outfit! The colors are great together but that floral print top is fantastic! 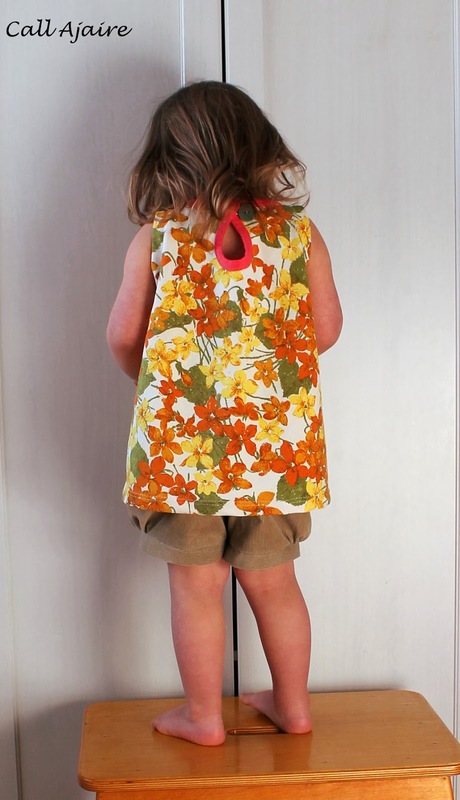 I have that dress pattern and shortening it to a tunic is such a great idea! And I love that I envy the hair of a 2 year old. I love how these pieces work together! The floral fabric for that top is gorgeous! This is so, so great!! I love the idea of those shorts over tights…adorable. I love every piece in this ensemble. That cardigan, especially…love that you used the sleeves. 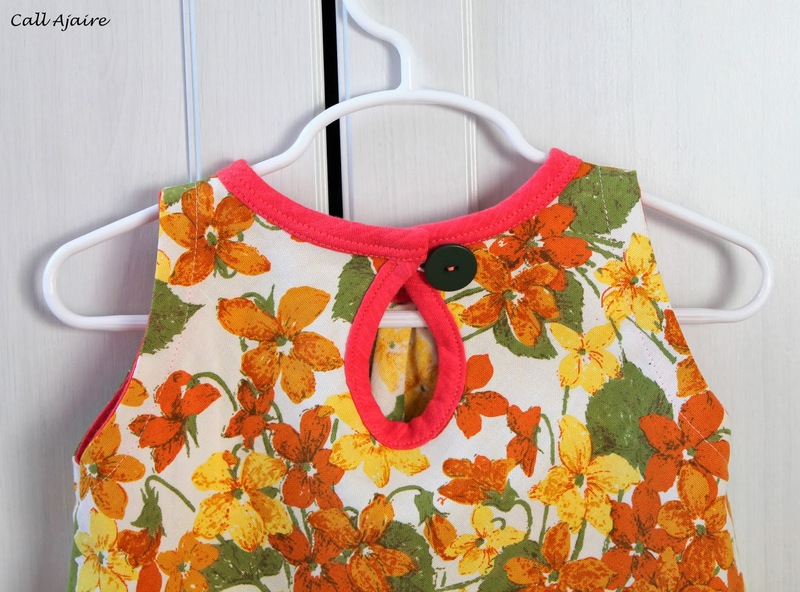 That is my favorite thing about refashioning…using those professional details in your own creation. Adds a whole new level. that print on the top looks vintage….love it! Great job. Great colors and fabrics. Gotta love photo shoots right? 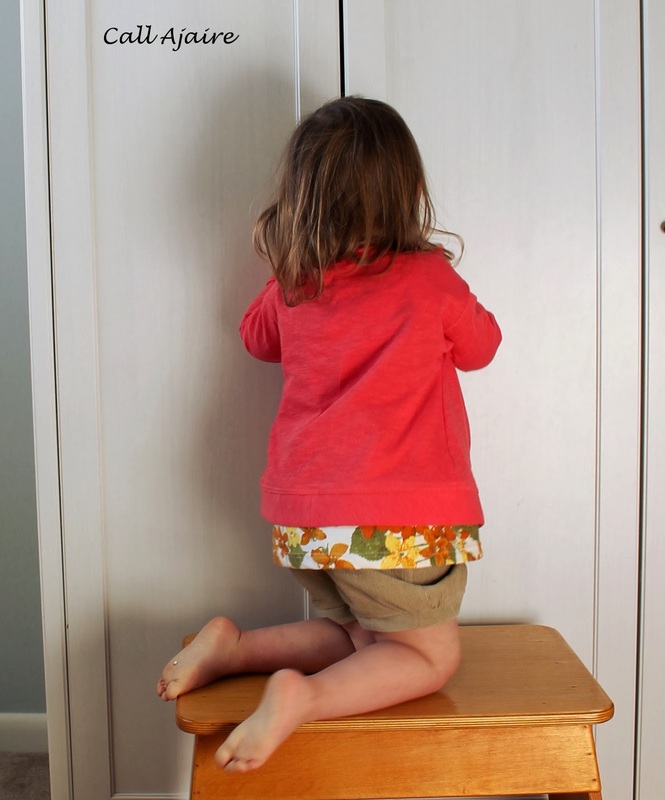 Never know how those little ones will behave. You got lots of good photos. February and March is our worst winter months too! Still can't help wishing Spring was around the corner. I LOVE the whole outfit! Makes me really wish Spring was here right now! I love all these pieces–and that they are not too matchy, but coordinate well. The top is so sweet-definitely vintage-y and lovely! 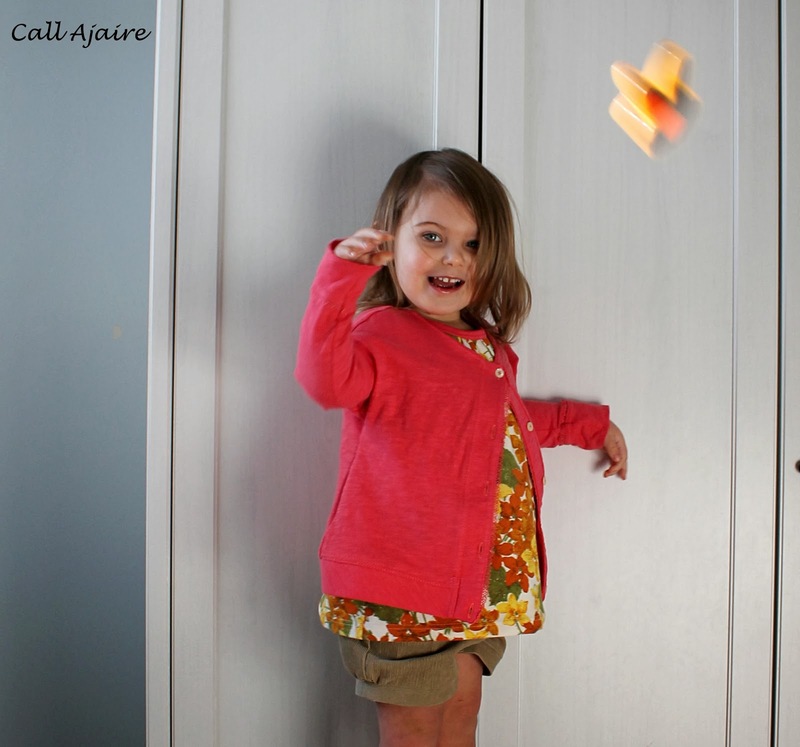 These pieces are great….separate, and as a whole!! 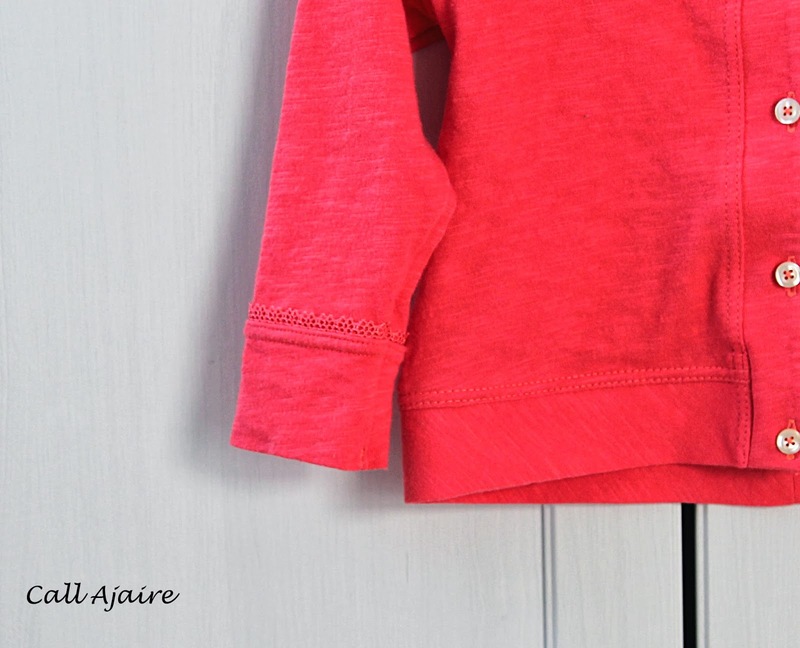 The color is so striking….and I love that little top underneath!! I love these colors/textures–what great pieces to take you into spring! great job here. I love the shorts!